According to Wikipedia, The Kingdom of Denmark also comprises two autonomous constituent countries in the North Atlantic Ocean: the Faroe Islands and Greenland. Denmark has a population of 5.75 million. Denmark introduced social and labour-market reforms in the early 20th century that created the basis for the present welfare state model with a highly developed mixed economy. The Constitution of Denmark was signed on 5 June 1849, ending the absolute monarchy, which had begun in 1660. It establishes a constitutional monarchy organized as a parliamentary democracy. Denmark is considered to be one of the most economically and socially developed countries in the world. Danes enjoy a high standard of living and the country ranks highly in some metrics of national performance, including education, health care, protection of civil liberties, democratic governance, prosperity and human development. The country ranks as having the world's highest social mobility, a high level of income equality, is the country with the lowest perceived level of corruption in the world, has one of the world's highest per capita incomes, and one of the world's highest personal income tax rates. Democratic Party leaders and presidential candidates so often tell us that we can have significantly more domestic services and pay for it by hiking taxes on the wealthy and large corporations. Would that it were so simple. Ask a Democrat what sort of America they want to build, and they’ll give you examples of things some other country has that they want to bring here. Finnish education, Canadian single-payer health care, European public transit — the list goes on and on. Sen. Bernie Sanders (I-Vt.) is the most open about his dream: He’s said that he wants the land of the free and the home of the brave to look a lot more like Denmark. What Democrats loathe to mention, however, is that Finns, Canadians and Danes pay for their services the old fashioned way — with higher taxes on everyone. Denmark was long the highest taxed country in the world until France surpassed it in 2017. The country as a whole pays 46 percent of its gross domestic product in taxes, much higher than the United States’ 27 percent. They get this high level of revenue by taxing ordinary citizens at extremely high levels. Take the income tax. Including all levels of tax, Danes making a bit more than 542,000 Danish krones pay a 56.5 percent marginal income tax rate. That sounds fine until you learn that it takes 6.6 krones to equal one U.S. dollar. That 542,000 krone income is equivalent to a bit more than $80,000 a year. Yikes! The taxes don’t stop there. Danes also pay a value-added tax (VAT) of 25 percent on almost everything they buy or consume, including services. Clothes, cars, smartphones and even haircuts all get 25 percent added directly into the price. They call the tax the Momsloven. Though the Danish word has nothing to do with what it sounds like in English, many Americans would find a mother’s love like this a form of abuse. Denmark is admittedly an extreme example, but no country pays for its welfare state with high taxes on the wealthy and on corporations. The recently passed tax bill that reduced the federal tax on large corporations to 21 percent only moved the United States in line with the international average. 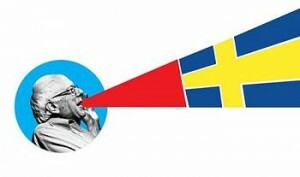 As a native of Sweden, I must admit this makes me Feel the Bern a bit. Sanders is right: America would benefit hugely from modeling her economic and social policies after her Scandinavian sisters. But Sanders should be careful what he wishes for. When he asks for "trade policies that work for the working families of our nation and not just the CEOs of large, multi-national corporations," Social Democrats in Sweden would take this to mean trade liberalization—which would have the benefit of exposing monopolist fat cats to competition—not the protectionism that Sanders favors. In fact, when President Barack Obama visited Sweden in 2013, the three big Swedish trade unions sent him a letter requesting a meeting. Their agenda: a discussion of "how to promote free trade." The chairman of the largest Social Democratic trade union scolded the American president for his insufficient commitment to the free flow of goods. This reality will not endear my home country to American socialists, but it's better to be hated for the right reasons than to be loved for the wrong ones, as the saying goes. Being more like modern Sweden actually means deregulation, free trade, a national school voucher system, partially privatized pensions, no property tax, no inheritance tax, and much lower corporate taxes. Sorry to burst your bubble, Bernie. In 1970, Sweden was 25 percent richer than the OECD average. Twenty years later, the average had almost caught up with us. Once the fourth richest country on the planet, Sweden was now the fourteenth. It was a disaster for entrepreneurship and employment. During this time, not a single job was created in the private sector (on net), despite a growing population. As of 2000, just one of the 50 biggest Swedish companies had been founded after 1970. What Would a Subzero Interest Rate World Mean?